Image provided with permission CDI Laboratories 2017. The HuProt™ single slide high-density format array provides greater than 19,500 unique proteins representing more than 16,152 human genes covering 81% of the human proteome for rapid profiling of samples. Recombinant proteins are expressed in yeast (S. cerevisiae) with an N-terminal GST-RGS-His6 tag, purified, and printed onto glass slides in duplicate spots. The HuProt arrays provide high-throughput, low sample volume screening for applications such as immune profiling for biomarker detection. In addition, the comprehensive array format can be utilized in determining protein-protein interactions for protein pathway analysis. 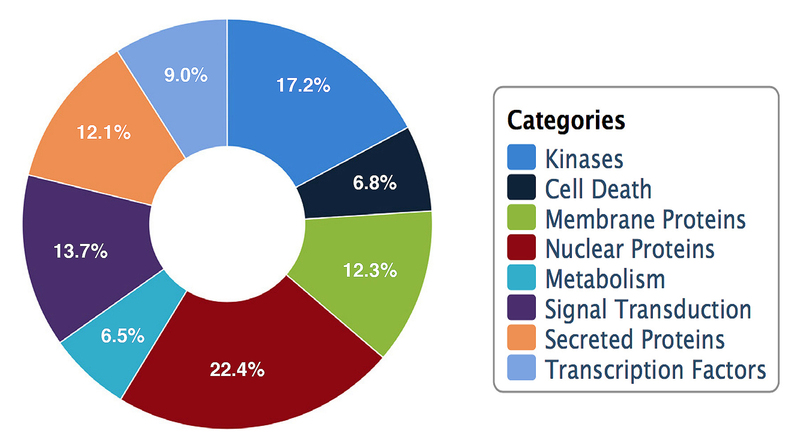 We are always interested to expand our current proteome collection. Please contact us and let us know which organism you are interested in!